In my last imaging session with the spectroheliograph, I observed strong filaments in both the H alpha and Ca K images. Here are the two images with the filament chosen for study at, roughly, centre disk towards the E limb. The analysis requires some elementary radiation transport theory and a measurement of the spectral profile for absorption by the filament from two atomic species, in the present case H and Ca(II). The starting point makes use of equation (2-17) in Soukal’s “Solar Astrophysics”, shown in the following figure. 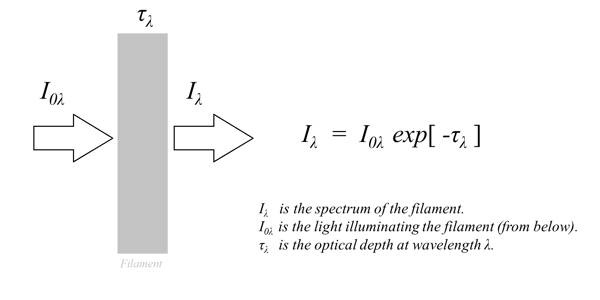 The equation above relates the transmitted intensity to the incident intensity on an absorbing medium (the filament) in terms of the “optical depth”, at a given wavelength, lambda. In addition to the temperature,T, there is a “non thermal” velocity component, Xi, contributing to the Doppler width which, according to Park et al. “arises from all kinds of unresolved motion along the line of sight, including random motions of fine-structure threads”. This is something I'm not too familiar with so ….. time for more research! The measurement of filament spectra arising from two different types of absorbing atoms (H and Ca) allows one to determine both the temperature and the non thermal velocity. 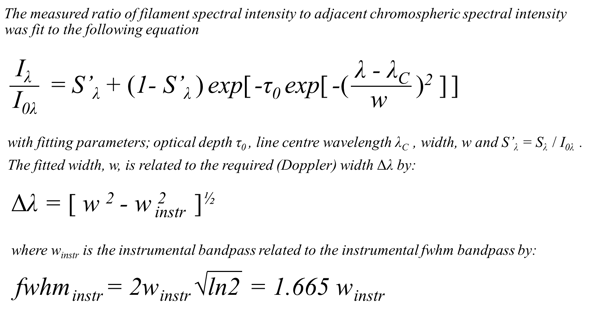 The exercise involved fitting the spectral profile of an intensity ratio: filament spectral intensity to underlying chromospheric spectral intensity. The model equation used is shown in the figure below and has, as fitting parameters, the optical depth, the absorbing linewidth and the line centre. 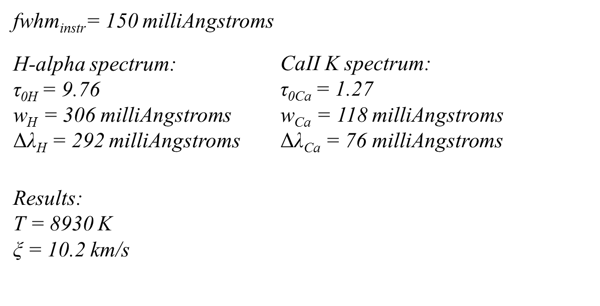 The fitting parameters were determined for both the H and Ca absorption spectra. As shown in the figure, a correction was applied to account for the instrumental spectral profile of the spectroheliograph. 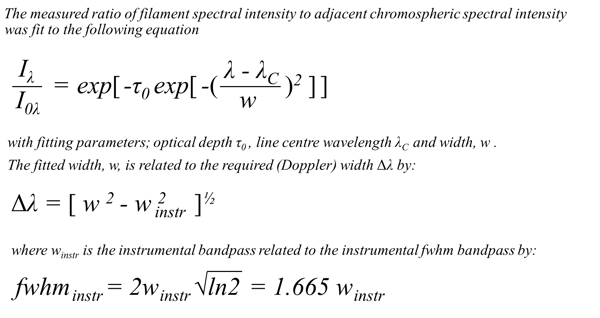 The next figure shows the intensity ratio spectra and the location in the filament and adjacent portion of the chromosphere where the measurements were made. The H filament is shown, but, of course, the same measurement locations were used for both H and Ca filaments. The yellow squares in the surface image indicate the area over which an average spectrum was measured. For the spectrum plots, squares represent the actual measured intensities while curves represent the results of applying the fitting model described above. Plotting the spectra in terms of wavelength detuning from (chromospheric) line centre allowed me to superimpose the H and Ca results on to the same plot. Note that there’s an interesting “hump” near the centre of the H alpha filament absorption line. Park et al. noticed a similar result in some of their prominence emission lines (a dip near emission centre was observed) for large optical depth. This type of feature is called a “central reversal” (for both absorption and emission) and its absence in the model spectrum is due to the breakdown of a simplifying assumption used, namely that “the source function is constant along the line of sight”. Foukal and others define and explain the significance of the source function. Fits to the spectral line profiles returned the values of three parameters: optical depth, line centre wavelength and linewidth. In both H and Ca cases the line centre wavelength of the filament absorption was close to zero, indicating the filament was relatively stationary with respect to the underlying chromosphere. Edited by Peter Z, 14 October 2018 - 10:38 AM. Exceedingly impressive work and RESULTS. Absorption line profile is very interesting. Bravo! And, what is the dispersion of your spectroheliograph system? Great results and great discusssion. Optical depth is an extremely important concept in both absorption and emission spectroscopy. One thing that makes these concepts difficult is relating the optical depth to the physical depth in the atmosphere. I doubt that the calcium emission and the hydrogen emission occur in the same place, although I guess the filament confines the absorption/emission. 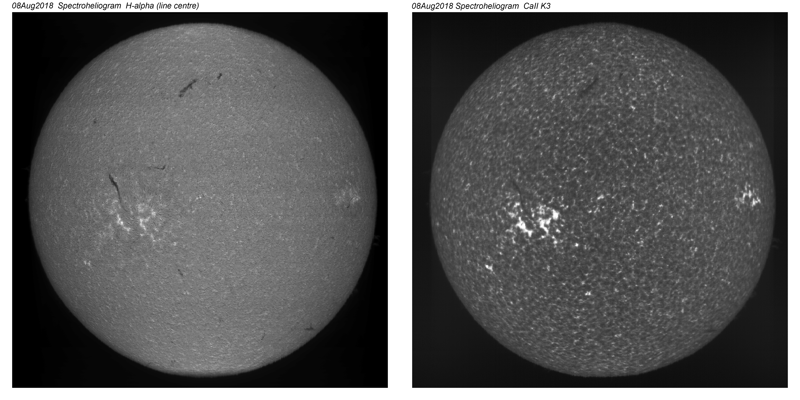 Also, although there are calcium and hydrogen emission in the chromosphere, isn’t any of the light from the photosphere observed at these wavelengths? Great results. Great discussion. Please continue. Edited by Organic Astrochemist, 14 October 2018 - 04:05 PM. Thanks for reading through this and commenting. Your thoughts are appreciated. It still surprises me that I can extract some reasonable science results with my spectroheliograph. The resolving power, R, at H alpha is about 44000 (150 milliAngstrom fwhm instrumental profile) for the configuration used with this imaging session. As far as “non thermal velocity” goes, I have to do more research. The authors who studied prominences, Park et al., say it “arises from all kinds of unresolved motion along the line of sight, including random motions of fine-structure threads”. I haven't investigated beyond this but I assume it has to do with random motions of field lines threaded through filaments/ prominences. However, that’s a guess on my part at the moment. Edited by Peter Z, 15 October 2018 - 07:21 AM. Thanks very much for your feedback and encouragement! I agree about saturation of H alpha absorption in the filament. The “flat bottom” of the absorption line bears this out qualitatively. As you suggest, the assumption that absorption in the filament is confined to its physical boundaries makes this type of analysis meaningful in the first place. I just assume that the filament can be modelled by a confined volume of gas illuminated from below by light with the spectral characteristics of the hydrogen or calcium chromosphere (and the deeper underlying photosphere). As far as photospheric light goes, it makes it’s appearance in the wings of the chromospheric line profile and is “normalized out” in fitting the ratio of intensities. For the strong chromospheric absorption in H or Ca, the closer you are to chromospheric line centre, the higher up in the solar atmosphere you are observing. This makes sense from the point of view of multiple absorption / re-emission events. Optical thickness / depth is proportional to the number of these scattering events. At line centre, there are many absorption / re-emissions because the absorption is strong and optical thickness is large. The “last” photon emitted into free space originates from a scattering event high in the atmosphere (chromosphere) and gives optical information about this location. In the absorption wings, the absorption is weak and the corresponding photon emitted into free space originates lower in the atmosphere (photosphere). As you move from line centre to line wings you are viewing deeper into the solar atmosphere. By way of illustration, the animation above (spectral sweep through the H alpha line) and the one below (sweep through the CaK line) can be viewed as a kind of "atmospheric tomography" with each video frame representing a solar disk view at a particular height in the solar atmosphere. The videos start in the line wings (photospheric "surface") and move (non linearly) to higher elevations at line centre, about 1300-1700 km peak height for H alpha and about 1800-2000 km peak height for CaK. Cheers and thanks again for your feedback. Edited by Peter Z, 14 October 2018 - 05:28 PM. It's unfortunate that I can't read the Park paper because it's behind a paywall. I think that you are talking about absorbing filaments and he seems to be referring to emitting prominences which is a great illustration of how optical depth is important in both absorption and emission. I really think it's essential to understanding astronomical spectroscopy. I think that you have assumed more than just that the source function is constant along the line of sight -- you have assumed that it is zero! That is, that there is no emission. I think that is incorrect for H and Ca in the chromosphere. I think your plot illustrates this beautifully. The filament is optically thin for Ca, so the light that we see that has passed through the filament "remembers" some of the underlying chromospheric absorbance, it contains the Iv0 term. Light passing through the chromosphere is selectively absorbed at the Ca wavelength, which means that the intensity of light away from the center is high. Also, as you show in an equation above, the optical depth increases at the line center, so absorption is greatest there. There is some emission in the filament, so the source function isn't zero, but it's small (compared to Iv0 from the photosphere and chromosphere) and worse, it's multiplied by the optical depth, which is low because this the optically thin case. Net result, a little emission peak is NOT seen the Ca line. The filament is optically thick for H, so the light that we see that has passed through the filament doesn't "remember" the underlying chromospheric absorbance, it doensn't contain the Iv0 term. The light isn't selectively absorbed like it was in the chromosphere around a narrow line, instead it is absorbed equally along the flat bottom section of your graph. However, it's not like there is no light detected at all at those wavelengths, there is a source function ( Iv = Sv ) and so some of the light that is absorbed gets re-emitted and we see that. But more specifically, the source function is greater at the H wavelength, so we see a peak, just like you showed in your graph. Does this make sense? I think if we can explain things that indicates some level of understanding. I think that analogous arguments can be made for optically thick prominences (which I think wouldn't show the absorption reversal) and optically thin prominences (which I think might show an absorption reversal in their emission spectra). Hopefully I'm getting some of this right. Thanks for making me think. Edited by Organic Astrochemist, 15 October 2018 - 08:55 PM. Awesome! Thank you, Organic Astrochemist, for this thorough and well-reasoned comment. The interesting (miraculous!) thing is that the more general fitting function that I previously used is (nearly) exactly appropriate for the correct model equation! All the numerical results I found for linewidth, optical depth and line centre are still valid. It is one of those happy circumstances where one error (too general fitting function) cancelled the other (overly simplistic model equation)! Additionally, I was able to determine the (constant) source functions for H and Ca from the fitting: for H, S = 0.71 and for Ca, S = 0.86 (normalized to the incident, spectral intensity). Of course, I'm much happier with this result. 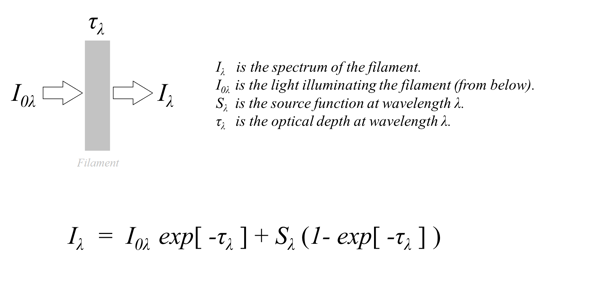 The original model equation (1st figure) has the proper limiting behaviour for very large and very small optical depth which you referred to in your last post. For large optical depth: I = S and for small optical depth: I = I0 + S*tau. As far as the small central reversal I observe in the H absorption, I can now more confidently quote Park et al: "The line profile in this case shows a central reversal in the core, which may be due to self-absorption arising when the optical thickness is very large. The failure of our analysis in this case comes from the assumption that the source function is constant along the line of sight." Although I haven't proved this, it makes sense from the physical argument you gave. My thanks again for the discussion in your post. I don't think I would have spotted my error had it not been for your feedback. This was a truly educational forum experience! Edited by Peter Z, 16 October 2018 - 09:41 PM.